In 12-inch nonstick skillet, cook beef over medium-high heat 5 to 7 minutes, stirring frequently, until brown. Drain; return to skillet. Stir in taco seasoning mix and water; heat to simmering over medium heat. Cook 1 to 3 minutes, stirring occasionally, until thickened. Transfer to large bowl, and set aside; carefully wipe out skillet. Add oil to skillet; heat over medium-high heat. Add onions, bell pepper, frozen corn and salt. Cook 7 to 10 minutes, stirring frequently, until vegetables are tender and beginning to brown on edges. Add rice and green chiles; cook 4 to 6 minutes, stirring frequently to break up rice, until heated through. Stir in beef mixture; cook 1 to 2 minutes longer to heat through. Remove from heat. Top with cheese; cover and let stand 1 to 3 minutes or until cheese melts. Don’t have cooked white rice from leftovers or takeout? Frozen cooked white rice is a nice staple to keep in the freezer to help ease the dinner rush on weeknights. Make it your own! 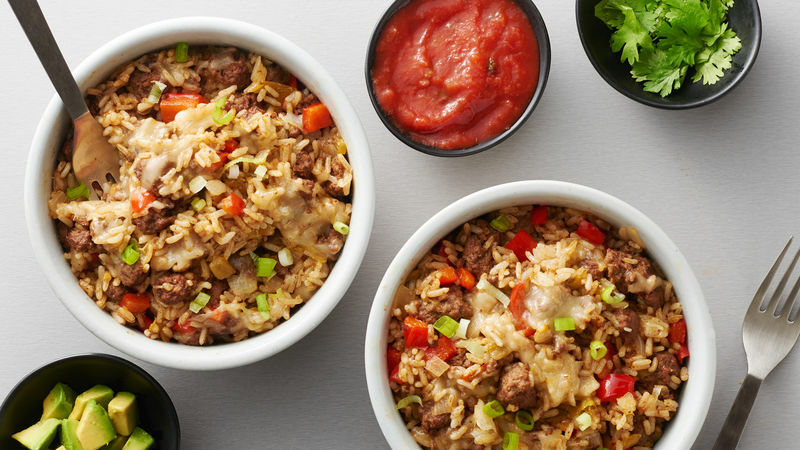 Try adding Sriracha or chile garlic sauce; experiment with different shredded cheeses, or mix up the diced veggies for your own twist on this easy meal.